Third Song, it's the podcast 100% video game music and 0% talk. On a monthly basis, we offer you an (almost) one-hour musical selection around a specific topic. For this fourth release, it's time to perfect your French, because we've named it "Au menu". The pun is easy to understand: we're referencing the "menu" as in "restaurant menu", but also as in "main menu" from video games, the same "main menus" that mark the beginning of great adventures! Both meanings are reflected in this Third Song's playlist, we hope you'll love it. 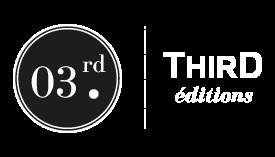 Third Éditions is a publishing house founded by Mehdi El Kanafi and Nicolas Courcier. It is dedicated to the video-gaming world. In 2010, Mehdi and Nicolas co-founded a publishing firm, Console Syndrome, which was bought one year later by a major publisher of video game books and magazines. Over the following four years, they edited and co-wrote twenty books, among them: Zelda. Chronicles of a Legendary Series, Metal Gear Solid: Hideo Kojima’s Magnum Opus, and The Legend of Final Fantasy VII. Since 2015, their publishing endeavors have seen them analyze major video game sagas through a new publishing house: Third.